Another day, another cool sword. 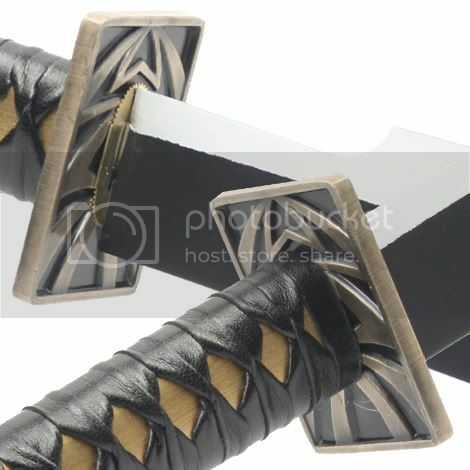 Today, a sword suggested by reader Heero, the Sakabato (Reverse bladed Sword) of Himura Kenshin, key protagonist of the manga and anime series Rurouni Kenshin. Himura Kenshin, was formerly a highly skilled assassin, called “Hitokiri Battōsai”. Hitokiri literally translates to “manslayer”. 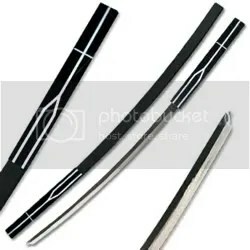 And while “Battōsai” has no direct meaning, there is a Japanese art called “Battōjutsu” which teaches the correct technique for drawing, cutting with, and sheathing a sword, much like Iaidō. 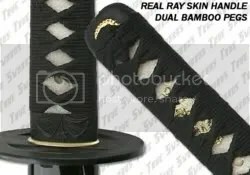 However while Iaidō deals primarily with the process of correctly drawing, cutting and sheathing techniques, Battōjutsu takes it a step further and teaches techniques for *multiple cuts* before resheathing. So together, the name “Hitokiri Battōsai” is perhaps one of the most ominous combinations you could ever have. And the name was not undeserved. During his time as an assassin, Himura Kenshin he was considered an unbeatable warrior, killing many, many people, until one day he decides that he has done enough killing. He becomes a rurouni, a renegade former assassin, who wanders the countryside helping people in trouble, to atone for his murderous past. Hence the name: Rurouni Kenshin. 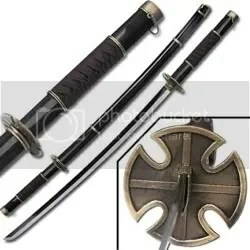 Once a rurouni, Kenshin meets a renowned Japanese swords smith called Arai Shakku, who has also decided to start making weapons for protection rather than killing, and it is he who gives the Sakabato to Kenshin. 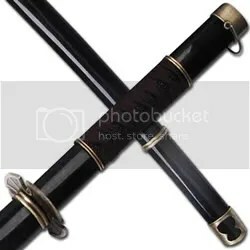 From the intro pic, you can see that this is a beautiful, though not particularly noteworthy sword, except for one thing. 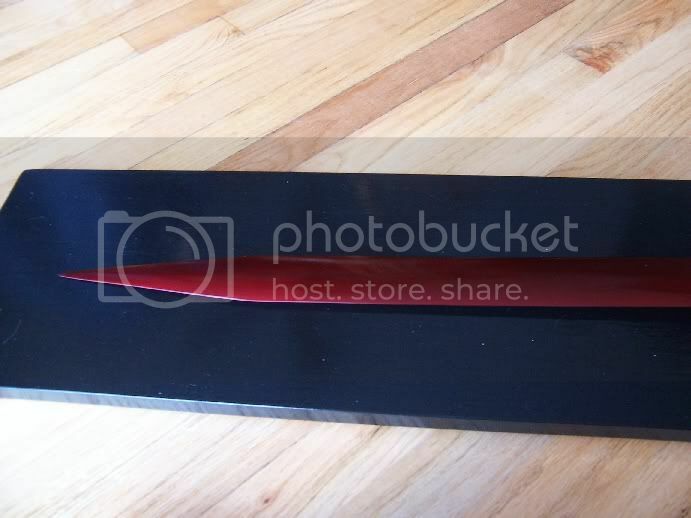 The edge is on the inside of the curve of the blade, as opposed to the outside. This is a symbolic feature, intended to externally show that it’s wielder is a pacifist, and that the sword is not intended for lethal combat. However the Sakabato poses a rather interesting structural question. The curve on a katana is a result of differential heat treatment, that makes the front edge of the blade hard, but leaves the spine flexible. During the tempering process, the front edge expands, while the spine does not, which results in the signature curve. Thus a traditionally heat treated Sakabato is technically a rather complex feat. Since only the heat treated edge of a blade will expand, a sword would never curve in the direction of the edge, only away from it. 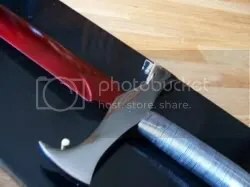 So the only way a sakabato could be traditionally be made would be to forge an exaggerated reverse curve into the blade, *before* heat treating. 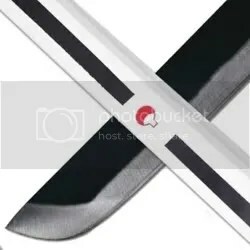 The curve would have to be enough to not only compensate for the resulting straightening that would occur during the heat treatment of the edge, but also still have enough curve left over for it to retain it’s signature Katana curve. It would take a very experienced smith to know exactly how much curve to forge into the blade. Perhaps that was the point. 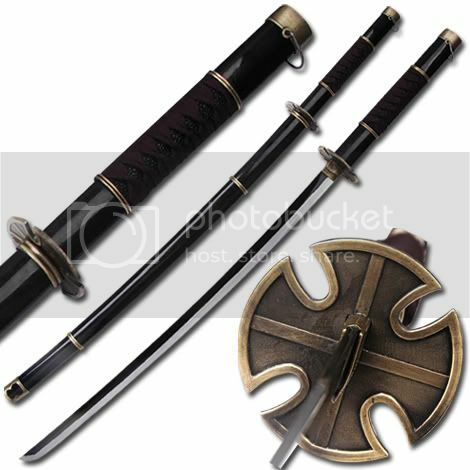 Perhaps successfully pulling off a Sakabato was the signature of a master swordsmith, and made it the ultimate pacifists weapon. Hmm. That’s cool an all, but I could think of better solutions. Like don’t use a sword at all, just use something else. Like a Louisville slugger. Maybe in steel. But that’s just my practical side speaking. Anyway, cool plot lines and metallurgical complexities aside, this replica is actually one of the nicer ones I’ve seen in a long while. From the simple black circular tsuba, to the gold accent on the pommel, it is a very accurate, and very well put together, sword. It might cut a hole in the fabric of space and time, and the tip may slice through, come out the other side and whack you in the back of the head. No, seriously, you gotta be careful with these kinds of things. Trust me, I’m a Balrog, I would know. 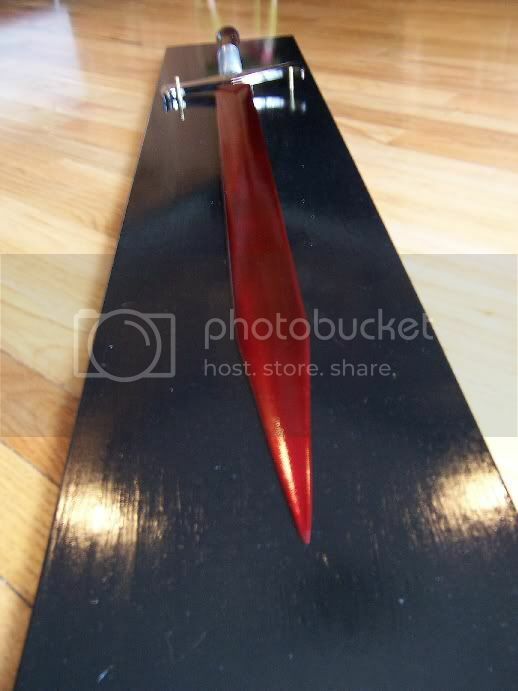 Cool Replicas – Part 3: The Kusanagi Grass Cutter. Welcome to the latest entry in my “Cool Replicas” series. Today, I’ll be talking about an interesting anime sword which I like for quite a few of reasons, the most cool (imho) being that the name of this sword actually has a history in Japanese culture. 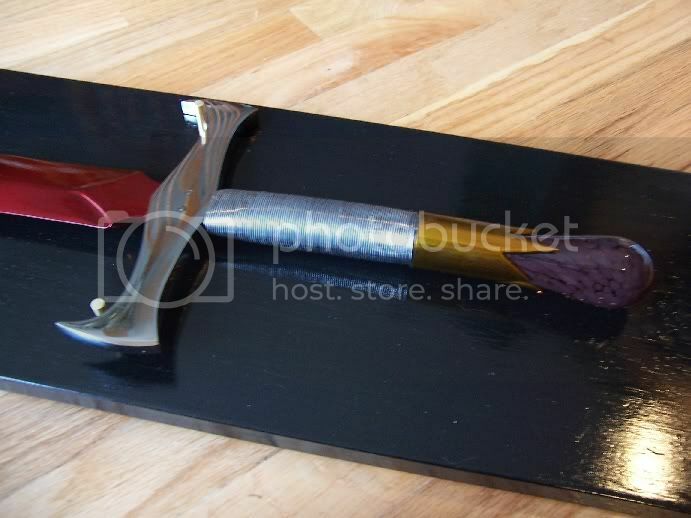 Kinda like the British Excalibur… More on that later. For now, let me introduce you to a unique shikomizue from the Naruto anime series (one of my favorites) wielded by Sasuke Uchiha, a highly talented young ninja, who later on becomes so entirely corrupted by his need for power that, much like young Anakin Skywalker, he succumbs to the dark side. 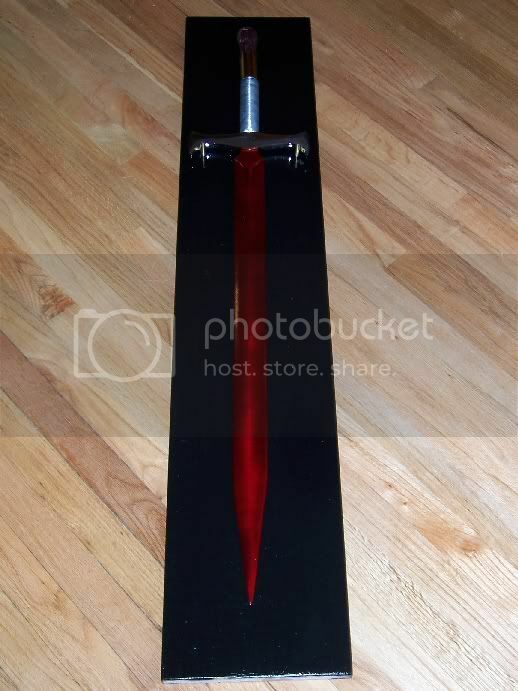 This is his signature weapon after his definitive turn to evil; The Kusanagi Grass Cutter sword. LOL yep. The astute among you might have picked up on my shikomizue reference before, and you would be right. 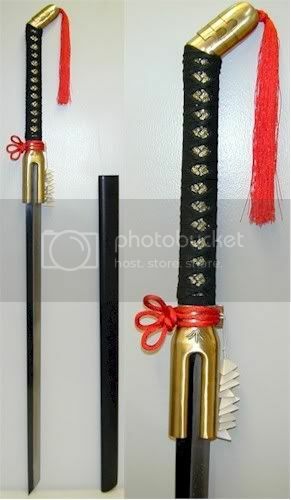 This is very similar in design to staff sword, saya and tsuki designed to look like a single piece of wood when closed. One of my very favorite designs. Ok, if you didn’t pick up on it that time, you phail. The blade is the other thing I like on this. Why? BECAUSE IT’S BLACK!!!! Ha! OK. Now that we’ve gotten those little details out of the way, a little more about the sword. One of the first things I noticed was that the saya and tsuki were rectangular in cross section, which is an unusual trait. 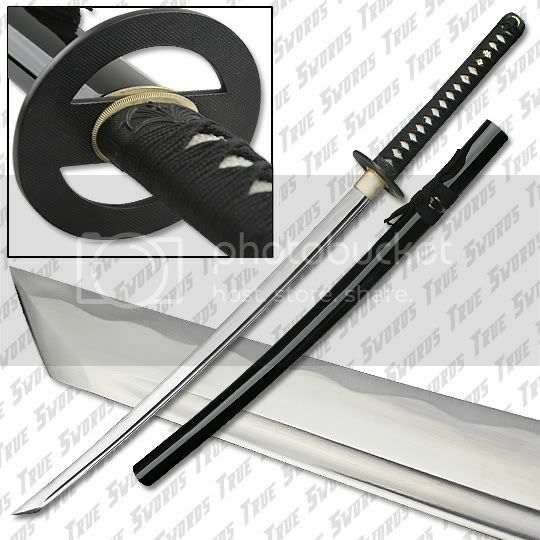 Below you can see the detail of the black and white rectangular saya, sporting Sasuke Uchihas clan crest, (the fan in red), and more importantly, the point of the blade, an interesting hybrid between the traditional sweeping Japanese katana point style and the straight cut, sharply angled points we see on modernized/westernized ninjaken today. Not so great. But now for some trivia. This particular design (in black) did not come out of nowhere. If you are one of the many who only watch anime on the cartoon channel here in the US, and don’t really know where they come from (besides from Japan, obviously) you may not realize that a great many of the popular anime series started of as Manga, or Japanese comics. 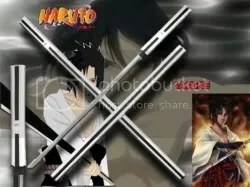 In fact most of the popular ones running now, like Naruto and Bleach, both got thier starts as Japanese comic books, and went almost immediately to TV syndication, so that the TV episodes aired almost as soon as a comic story line arc was complete. (Sometimes sooner, which often causes frequent non-storyline related filler arcs, much to my, and many others, chagrin). Anyway the reason I brought this up is that there is a discrepancy between the Anime version and the Manga version of The Kusanagi sword. The versions we see above are actually the Manga version of the sword. The version that first appears in the Anime is a straight shikomizue (no curve) with a black saya and tsuki (no white lines), and a polished steel blade, quite similar to the black one above (except straight). OK, so enough with the Anime trivia, on to Japanese folk history. The name of this sword is actually the name of a legendary sword in Japanese culture. 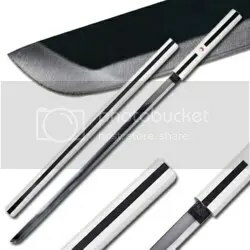 The name “Kusanagi Grass Cutter” is actually a Japanese/English mix of the traditional name Kusanagi-no-Tsurugi, which literally translates to “Grass cutter sword”. 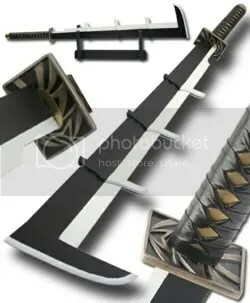 An astute reader, Zharkman, was kind enough to point out that my assumption about the last, black sheathed sword being a rip off of Sasukes Kusanagi is actually false, and that it actually came from the anime D. Gray-Man. I went back and looked it up, and lo and behold, I goofed! The last sword is actually a replica of Mugen, the signature shirasaya of the D. Gray-Man protagonist Yu Kanda. And in that capacity it is actually an excellent likeness. This is what I get for making unfounded assumptions. And for not keeping up on my anime… There are just too many of them… Dagnabbit! 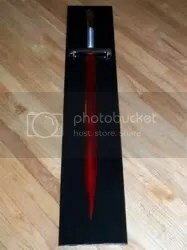 This sword is the Shikai form of Kisukes Zanpakuto Benihime (Crimson Princess), which is a sword cane with a curved handle in its unawakened form. In an earlier post, I had talked a little bit about how I thought this particular design actually had a lot of good practical design point. I won’t go over its detailed physical attributes again, but I will point out that the other sword was not so much a sucky sword as much as it was not as detailed, accurate and meticulously finished as this one. In this design, you can see a lot more effort has been put into giving it more depth and character. In this one the canted pommel is much more prominently featured, as is the unusual ricasso. The little triangles attached to the ricasso actually hang from a tassel in the anime, but I suppose it’s a minor detail that is not of much structural significance. It is difficult to tell from this pic whether this shares the same full tang construction of the first Benihime I posted about, but if it does not it would be an inferior design, though it would make for an interesting contrast. Shame that the pictures are not particularly clear about how well put together this weapon is at a physical level. If I were a betting creature, I would guess this build is structurally of lesser quality than the other. Which makes this kind of a bittersweet weapon to post about, since even though the it is a much more “accurate” reproduction compared to the other, the other one appeared to be constructed in a way that would still make a superior weapon. So while It’s aesthetically clearly superior, and gets a good grade on accuracy, fit and finish, the practicality and the durability of it’s construction may leave something to be desired. Why does it seem like there is always a trade off somewhere… ? The regular readers on this here blog thingy will know that one of my pet peeves is cheap, poor, inaccurate and otherwise needlessly mediocre reproductions of cool weapons that could very easily have been made to much more closely mimic the weapons they were inspired by. Now I realize that cost is always a factor. And that many repro houses are simply out to make a quick buck off a blockbuster movie, anime or video game, but sometimes I think the lengths to which they go to save said buck makes no sense. 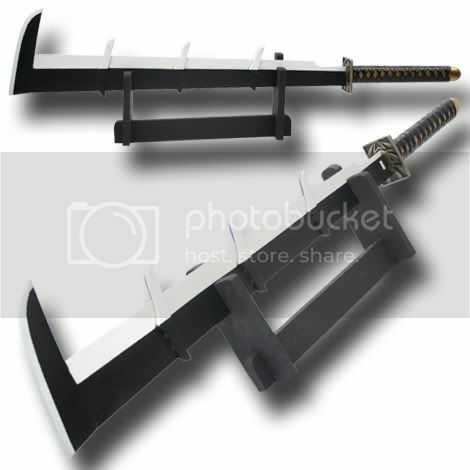 A typical example was the first reproduction of the Zanapkuto Zabimaru from the Anime Bleach. If you will remember, I was clearly not pleased with what they did to it. However I was pleasantly surprised to find another version of it that was a much better match to the anime weapon. And since I also had a couple of readers send me links to improved versions of weapons I had griped about in the past, I thought I’d make a little mini series of posts related to them. Now THIS is a reproduction. 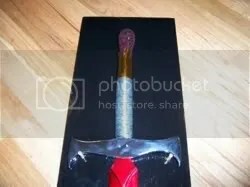 This, my friends, is a solid steel version of Zabimaru, replete with all of the original evil spikes, points, and other bladed wickedness that Zabimaru tends to sport. 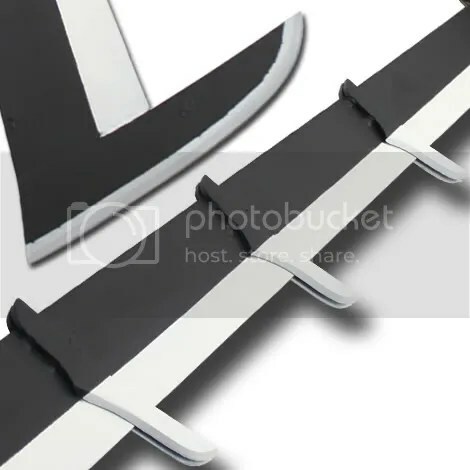 As you can see from the pic, this version is not a dumbed down version of the blade, as the other one was, and actually does a very good job of reproducing a design that would admittedly be very difficult to manufacture cheaply. The pic below is of the hilt of Zabimaru, and it’s a good indicator of the quality of the build on this blade. You can see that there is a lot of attention to detail, and a lot of work went into the fit and finish of this replica. However the most telling feature is how they captured one of the more difficult to replicate aspects of Zabimaru’s design: The blade spikes. In the Anime, Zabimaru is actually a sectioned blade, and each section is able to move independently, like a blade whip. Each spike actually coincided with the transition between one segment of blade to the next, and created a very prominent ridge to visually make this distinction. 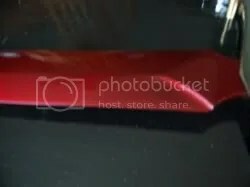 Now the reality of it is that making a real sectioned blade would be almost impossible to manufacture at any kind of reasonable price point in real life. Ok… So anyway, as opposed to what the last HACKS and CHARLATANS did, the pic above shows what those designers should have done. The smart thing. The good thing. The kind of thing that brings glory and honor to evil spiked weapons everywhere… 🙂 Add steel blade spikes to either side Zabimarus’ blade to replicate the ridges and spikes of the anime version! These guys are geniuses! So overall, I’d have to say I’m pretty impressed with this rendition of Zabimaru. 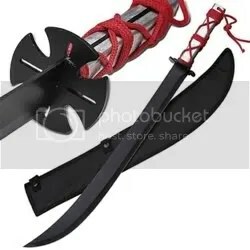 And work like this this clearly demonstrates something that I, and many blade enthusiasts like me, have said all along. 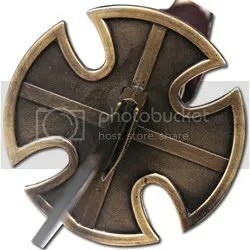 There is really no need to go the dirt cheap route with a replica blade. Most folks will pay a little more for a well constructed replica, so there is a good business case for making high quality reproduction blades. All it takes is for a designer who is interested in quality, as opposed to just churning out trash. And if this replica is any indication, it means there actually exist living, breathing, thinking, non bean counter controlled replica houses who are just as interested in accuracy and quality as in making a buck.